I've had my implant in for a month now so I thought I'd give you a little update on it all. When I had it put in to my arm, I had been on my period for two days already. My period was just it's normal self at first, but, the day after having the implant put in, it ramped up and became incredibly heavy. I'm talking the heaviest it's been in years and I was needing to change pads every half an hour because, sorry to be so blunt, but it was just pouring out of me. The next day it was still as heavy and that morning I almost passed out from it. I was actually sat on the toilet when I suddenly didn't feel right and got this horrible pounding in my ears. If I hadn't have gotten down on to the floor quickly, I would have gone. It was pretty scary. Although I didn't put two and two together at the time, it's no coincidence this happened only two days after starting a new treatment. My period lasted two weeks and I was in just as much pain as usual. I had a one week break and then this month's period started early and I've been on that for over a week now. This month has been much easier (so far). The pain has been very bad still, on one night in particular it felt like I was having contractions as it was coming in waves, but the bleeding has been reasonably light and I haven't had any new, red blood. I'm going to give it another few months to see what happens with it and then have a think about going back to the doctors if I continue to bleed. The fact that I'm still in the same amount of pain as when my period is at it's heaviest but I'm actually having quite a light bleed, is a big concern. Besides effecting my periods I've also noticed a few other things. My moods have been terrible. The first 2 weeks were the worst as I felt up one minute and down the next. I was incredibly irritable and was snapping at everyone. That's settled a little now I think (maybe Danny would tell you differently! ), but I am quite emotional and very sensitive still. I've felt very down over the last few weeks and have been crying a lot - every day in fact. I know it's to be expected because I've had this sudden rush of hormones put in to me, but it is quite hard to deal with when you've felt quite level headed for a good while now. I've also been getting frequent headaches, a daily upset tummy, my acne is definitely worse already, my breasts are so tender I dread even my t shirt rubbing on them let alone letting my breastfeeding toddler near them, and my libido has completely gone out the window. So, all in all, I'm just not feeling very good about myself right now. Oh, and the bruising! Oh, the bruising! It was so bad, I had people coming up to me while I've been out asking what I'd done! And to think the bandage was there to help reduce the bruising! I've popped a photo up above of it at it's worst which was about a week after it was 'implanted'. 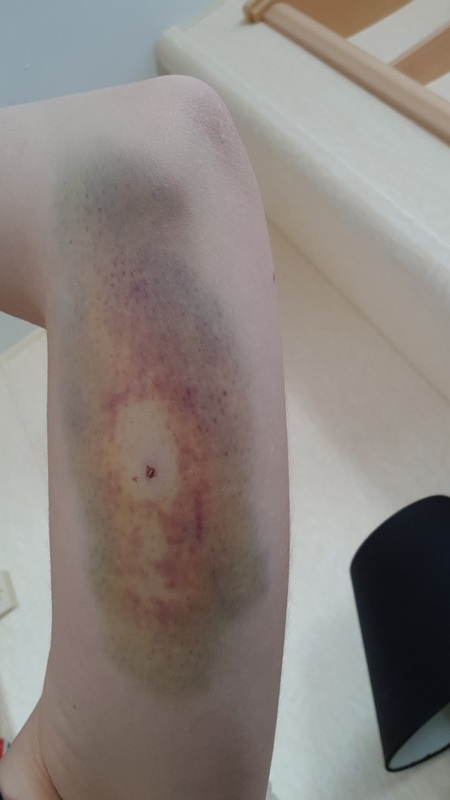 I've still got some bruising now but it looks more like a pale stain to my arm rather than a multicoloured gangrenous rotting mess! I know that things should all settle down in time but I'm experiencing everything I didn't want to happen at the moment. It's such an odd feeling when you go from only having your own natural hormones in you to the rush of a hormonal treatment. I feel separate to myself, if that makes sense, and I really don't like it.